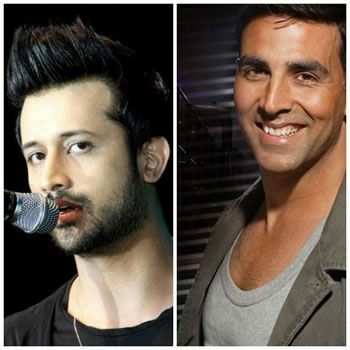 Atif Aslam has a shining singing career both in Pakistan India and has sung number of songs, his latest venture is to lend his voice to Bollywood superstar Akshay Kumar for his upcoming masala flick ‘It’s Entertainment’. Atif Aslam is an award winning Pakistani pop singer who has been singing for both Indian and Pakistani movies and some of his songs also got featured in Hollywood movies. Now after the big hit of title song of Race 2 and many more Bollywood films, he will be singing for Akshay Kumar and Tamanna Bhatia starrer Bollywood film ‘It’s Entertainment’. ‘It’s Entertainment’ is being made under the banner of Tips Films and the dialogues of the film are written by Sajid-Farhad, the famous duo who write dialogues for popular comedy films Bol Bachan and Golmaal series. The main cast of ‘It’s Entertainment’ includes Mithun Chakraborty, Sonu Sood, Prakash Raj, Johnny Lever and Krushna Abhishek. The shooting of the film will be done in Mumbai and Bangkok.